Neurogenic stunned myocardium (NSM) is an acquired, transient type of systolic dysfunction causally associated with a central nervous system (CNS) pathology. Highly elevated plasma and CNS catecholamine levels following overactivation of the sympathetic nervous system are widely considered to be responsible for NSM. Most NSM patients are elderly women, and NSM has been considered rare in pediatric individuals. ,,,,,,, We herein report a case of pediatric NSM associated with a brain tumor. Measurement of plasma and urinary catecholamine levels provides an insight into etiopathology of pediatric NSM. A previously healthy 6-year-old boy presented to our emergency department with a rapidly progressive altered mental status. He was comatose and moderate right-sided hemiparesis was noted. Brain computed tomography together with brain magnetic resonance imaging revealed a hemorrhagic lesion extending from the thalamus to the midbrain with marked ventricular dilation. Bleeding from a preexisting brain tumor and subsequent hydrocephalus were suspected, and an emergency ventriculostomy was performed shortly after admission. Despite the improvement in his consciousness level after surgery, he became hypotensive, tachycardic and hypoxic on hospitalization day 3. 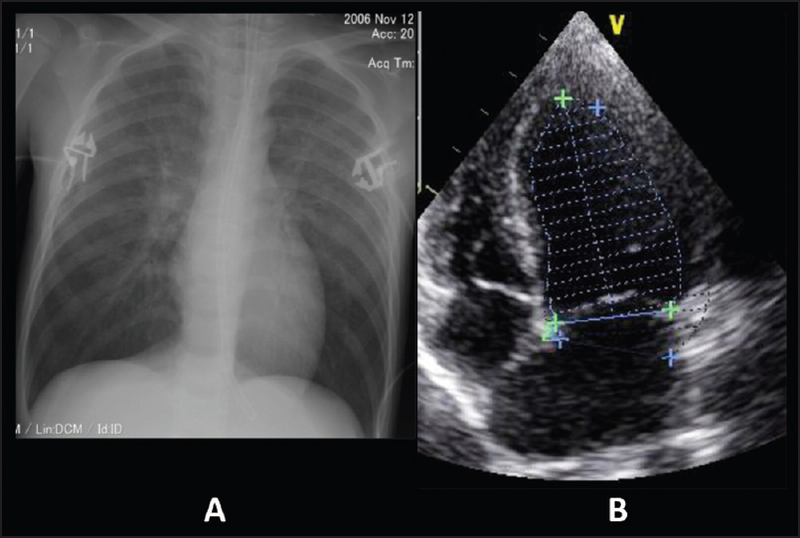 A chest X-ray showed sharply defined pulmonary markings accompanied by blurring of the perivascular outlines, suggesting neurogenic pulmonary edema [Figure 1]a. Subsequent transthoracic echocardiography (TTE) showed left ventricular wall motion abnormalities with a markedly hypokinetic apex and a hyperkinetic base, that were compatible with NSM [Figure 1]b and supplementary Video clip 1]. Time course measurements of systolic blood pressure, systolic function, and PaO 2 /FiO 2 ratio were summarized in [Figure 2]. The left ventricular ejection fraction (LVEF) on TTE was 35%, and the PaO 2 /FiO 2 ratio was 275. He received intensive cardiopulmonary support with the administration of inotropic agents and positive end-expiratory pressure. At onset, blood marker levels were as follows: White blood cell count, 14100/mm 3 ; N-terminal pro-brain natriuretic peptide, 2800 pg/mL; epinephrine, 140 pg/mL; norepinephrine, 309 pg/mL; dopamine, 17 pg/mL; aldosterone, 212 pg/mL; and blood glucose, 141 mg/dL [Table 1]. Urinary epinephrine and norepinephrine levels were 35 pg/mL and 91 pg/mL, respectively [Table 1]. 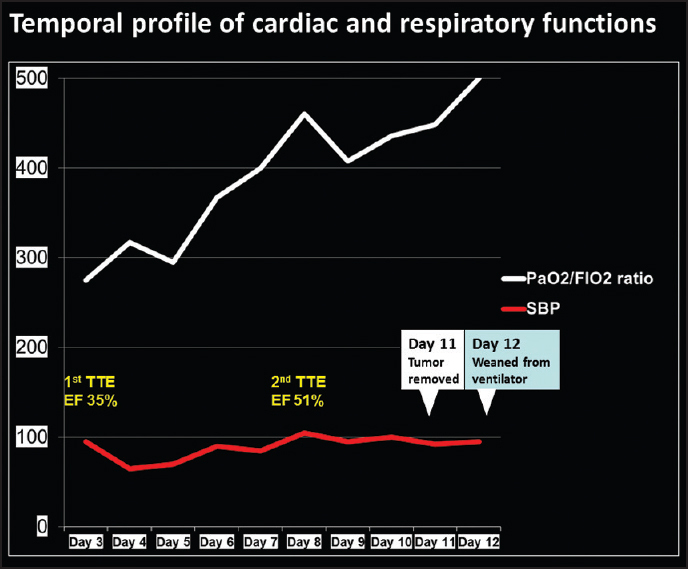 Supportive therapy substantially improved his cardiorespiratory functions by hospitalization day 8: A follow-up TTE exhibited normal-shaped cardiac ventricles. His LVEF increased to 55%, and the PaO 2 /FiO 2 ratio increased to 460 [Figure 2]. On hospitalization day 11, he was able to undergo surgery to remove the tumor. Recovery from surgery was uneventful, and he was discharged home with mild deficits 2 months after admission. Permission was granted from the patient's guardians for this report. NSM is most frequently associated with severe cerebrovascular disorders like subarachnoid hemorrhage. Risk factors for NSM include advanced age and female gender, and elevated catecholamine (epinephrine/norepinephrine) levels in plasma and CNS are causally associated with NSM. Norepinephrine rather than epinephrine seems to be more relevant in the pathogenesis of NSM. It is not unusual in clinical practice for NSM patients to exhibit plasma and urinary catecholamine levels that are elevated 10-20 fold more compared with levels in normal healthy subjects. NSM has only been rarely reported in the pediatric population. After a vigorous literature search, only 10 cases (including ours) of pediatric NSM were identified [Table 2]. ,,,,,, This case report may be one of the first to document plasma and urinary catecholamine levels in pediatric NSM patients. The plasma and urinary norepinephrine levels were within normal range except mildly elevated urinary epinephrine levels [Table 1], suggesting that pediatric NSM may not be catecholamine-induced. An interval more than 48 h between symptom onset and development of NSM may indicate that acutely elevated plasma catecholamine levels at onset might have returned to normal by the time of sample collection. However, urinary catecholamine levels might have been elevated as well if there had been such early elevation in plasma catecholamines: Normal urinary catecholamine levels may be another indirect evidence to support our hypothesis. In pediatric NSM, causative brain lesions are mostly brainstem/cerebellar tumors and are frequently accompanied by hydrocephalus [Table 2]. ,,,,,, This pattern indicates that compression to the vasomotor nuclei in the medulla oblongata may be a triggering event for NSM. Frequently concomitant neurogenic pulmonary edema [Table 2] may also be explained by the overactivation of the medullary vasomotor nuclei. NSM by itself may also be causally associated with neurogenic pulmonary edema. Considering the fact that the great majority of pediatric patients with hydrocephalus do not develop NSM, however, other factors, such as genetic susceptibility, may also be involved in its pathogenesis. Development of pulmonary edema may have been merely a result of intra-/post-operative fluid mismanagement: According to a recent literature review, the majority of cases summarized developed NSM in the perioperative period. We acknowledge that solid conclusion may not be drawn based on experience from a single case: Because of its rarity, establishing a national or international registry is warranted to accumulate more cases for the elucidation of pathophysiology of pediatric NSM. Sugimoto K, Inamasu J, Hirose Y, Kato Y, Ito K, Iwase M, et al. The role of norepinephrine and estradiol in the pathogenesis of cardiac wall motion abnormality associated with subarachnoid hemorrhage. Stroke 2012;43:1897-903. Divekar A, Shah S, Joshi C. Neurogenic stunned myocardium and transient severe tricuspid regurgitation in a child following nonaccidental head trauma. Pediatr Cardiol 2006;27:376-7. Drayer M, Geracht J, Madikians A, Harrison R. Neurogenic stunned myocardium: An unusual postoperative complication. Pediatr Crit Care Med 2006;7:374-6. Johnson J, Ragheb J, Garg R, Patten W, Sandberg DI, Bhatia S. Neurogenic stunned myocardium after acute hydrocephalus. J Neurosurg Pediatr 2010;5:428-33. Schoof S, Bertram H, Hohmann D, Jack T, Wessel A, Yelbuz TM. Takotsubo cardiomyopathy in a 2-year-old girl: 3-dimensional visualization of reversible left ventricular dysfunction. J Am Coll Cardiol 2010;55:e5. De Rosa G, Pardeo M, Di Rocco C, Pietrini D, Mensi S, Stival E, et al. Neurogenic stunned myocardium presenting as left ventricular hypertrabeculation in childhood: A variant of Takotsubo cardiomyopathy? Pediatr Crit Care Med 2011;12:e420-3. Alados Arboledas FJ, Millán-Miralles L, Millán-Bueno MP, Expósito-Montes JF, Santiago-Gutierrez C, Martínez Padilla MC. Neurogenic stunned myocardium in Pediatrics. A case report. Rev Esp Anestesiol Reanim 2014;pii: S0034-935600296-5. Wittekind SG, Yanay O, Johnson EM, Gibbons EF. Two pediatric cases of variant neurogenic stress cardiomyopathy after intracranial hemorrhage. Pediatrics 2014;134:e1211-7. Finsterer J, Stöllberger C. Neurological and non-neurological triggers of Takotsubo syndrome in the pediatric population. Int J Cardiol 2015;179:345-7. Eichler I, Eichler HG, Rotter M, Kyrle PA, Gasic S, Korn A. Plasma concentrations of free and sulfoconjugated dopamine, epinephrine, and norepinephrine in healthy infants and children. Klin Wochenschr 1989;67:672-5. Inamasu J, Hayashi T, Oheda M, Yamashiro K, Tateyama S, Kogame H, et al. Cardiac wall motion abnormality after bleeding from vertebral artery aneurysms. Clin Auton Res 2014;24:259-64.